With an unusual body shape and reduced opercular spines, this singular clownfish stood out among other Philippine exports. Image courtesy Northstar Aquatics. “For as long as I’ve done this, finds like this still get me excited!” said David Liemohn, owner of Northstar Aquatics, an aquarium livestock importer and wholesaler based in Savage, Minnesota. 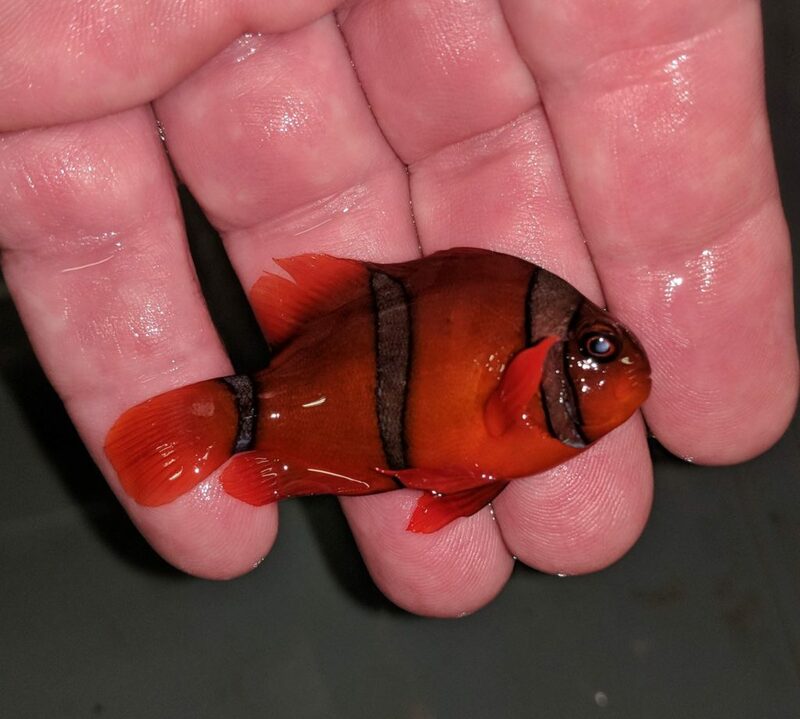 It’s hard to say for certain, but there’s a good chance that Leimohn got lucky recently with the arrival of an unusual clownfish mixed into a shipment from Manila, Philippines. This unique specimen was reportedly collected in the waters of the Zambales province in central Luzon. 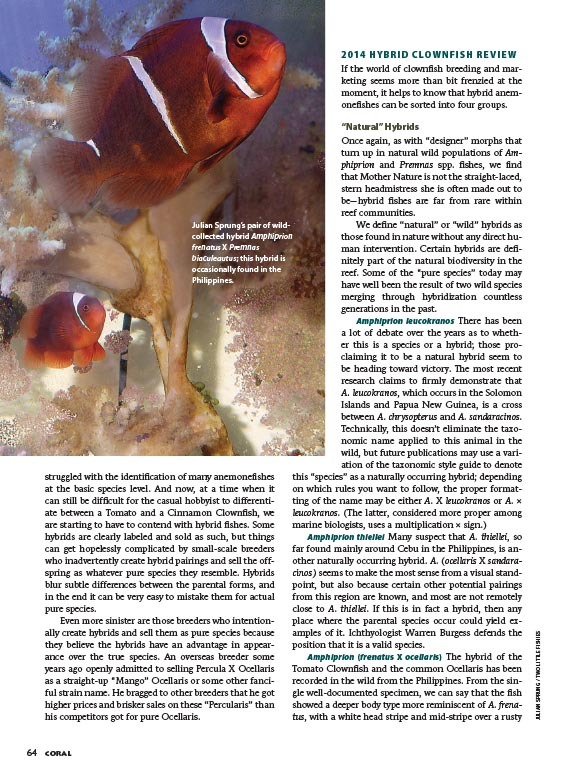 Julian Sprung’s wild pair of Tomato X Maroon hybrid clownfish, as they appeared in CORAL Magazine. Exported simply as a Maroon Clownfish, Premnas biaculeatus, this unusual fish sported dark-colored bars upon unpacking, a coloration occasionally seen in Maroons. More unusual, the body is deeper vertically than a Maroon’s normally would be, and the face shape seems abnormal as well. Faint black leading edges on the ventral fins are also an unusual trait for a Maroon, and the small spines on the operculum certainly suggest that this fish is anything but a normal Maroon Clownfish. 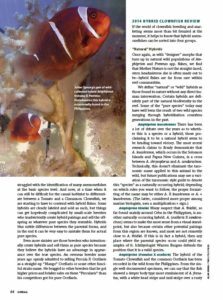 All of these traits seem to indicate that this is the latest example of a hybrid that’s occasionally seen and collected in the Philippines: the mating of a Tomato Clownfish, Amphiprion frenatus, with a Maroon. We’ve shown similar hybrids in a prior issue of CORAL Magazine (WILD CLOWNS, Sept/Oct 2014), illustrating a pair owned and photographed by Julian Sprung of Two Little Fishies. The following day, Liemohn has now shared an updated image of the fish which has since discarded the likely stress-induced dark barring for a more typical coloration seen in Maroons from the Philippines. The photo also better depicts the dorsal fin of this interesting fish. 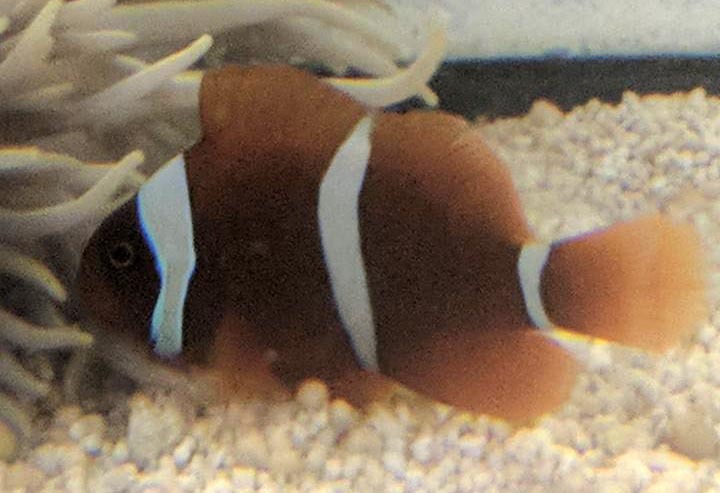 A better look at this unusual clownfish once settled in after import. You can save your clamoring and phone calls trying to get this one-of-a-kind rare clownfish. According to Liemohn, it is headed to local marine fish breeder Vossen Aquatics. Two years ago I was living in Bali Indonesia after setting up an aquaculture facility called LATC (Les Aquaculture and Training Centre) for an NGO called LINI, at Les Village an Ornamental Fish collecting village for international export through Denpasar Bali. I was breeding the endangered Banggai Cardinalfish Pterapogon kauderni and teaching fish husbandry and breeding. We bred over 2000 Banggai and exported 1490 to an importer at London airport. I am now back in Australia. The Premnas biaculeatus hybrid you show here, I saw in North Bali at a resort house reef. One small specimen in a bubble coral with those gun metal blue bands. i was very excited to see it, but was banned from collecting it by my friend the manager of the resort. I am pleased to see your feature with the example from Manila. Hi Damaso, Two years ago I was living in Bali Indonesia after setting up an aquaculture facility called LATC (Les Aquaculture and Training Centre) for an NGO called LINI, at Les Village an Ornamental Fish collecting village for international export through Denpasar Bali. I was breeding the endangered Banggai Cardinalfish Pterapogon kauderni and teaching fish husbandry and breeding. We bred over 2000 Banggai and exported 1490 to an importer at London airport. I am now back in Australia. The Premnas biaculeatus hybrid you show here, I saw in North Bali at a resort house reef. One small specimen in a bubble coral with those gun metal blue bands. i was very excited to see it, but was banned from collecting it by my friend the manager of the resort. I am pleased to see your feature with the example from Manila.